Lovers: Winners & Losers – Pavilion Theatre – Review by Frank L.
Under the direction of Hilton Edwards, Lovers received its first production in 1967 at the Gate Theatre. It portrayed an Ireland on the cusp of the social change which was to transform the everyday life of its citizens, both North and South of the border, in the following fifty years. This new production started life in the Lyric Theatre in Belfast and is in the Pavilion for one week only. The play has two distinct parts:. Winners is concerned with a teenage girl, Mag Enright (Ruby Campbell), and her boyfriend Joe Brennan (Thomas Finnegan), who are in the run-up to their school exams. They have agreed to undertake some final studying at a remote, elevated spot, overlooking their small town. The couple seem as different as chalk and cheese so it is surprising to be told that they are to be married. The reason is that she is pregnant and marriage was, at the time, one of the societal solutions to a pregnancy outside marriage. 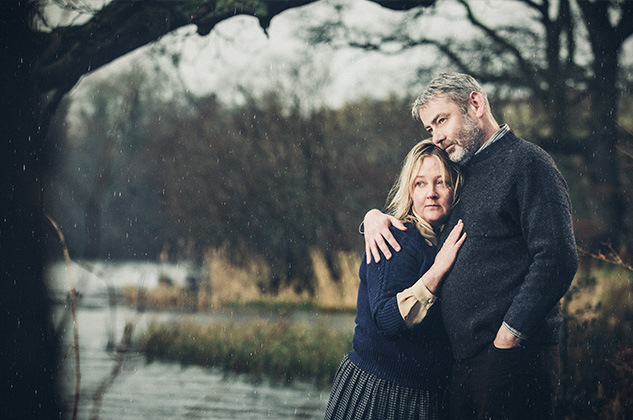 Losers portrays a couple, Andy Tracey (Charlie Bonner) and Hanna Wilson (Abigail McGibbon), who have found each other in their middle years. Their love affair is beset by frustrations caused primarily by Hanna’s mother Mrs. Wilson (Helena Bereen), who has taken to the bed, where she enjoys her ill-health to the full, while indulging her maniacal devotion to her favourite saint; Philomena. In this latter activity she is ably assisted by her next door neighbour Cissy Cassidy (Carol Moore). The set designed by Ciaran Bagnall creates by use of a raked, diamond shaped platform (at its lowest point about eight feet above the stage floor) a vertiginous mountain top in Winners and converts into a claustrophobic two storey, pinched dwelling in Losers. The young lovers are indeed on the verge of life in Winners while in Losers, Andy and Hanna are hemmed in and trapped by their suffocating surroundings. Winners has Man (Charlie Bonner) and Woman (Abigail McGibbon) acting as narrators to the story of Mag and Joe. In Losers, Friel dispenses with separate narrators and it is Andy Tracey himself who recounts his frustrated love story. Both parts require the actors to display considerable verbal dexterity, none more so than Ruby Campell as Mags. Her confidence and sure footedness was all the more remarkable given the perilous spots from where she had to deliver many of her lines. The play is over fifty years old when it was a commentary on contemporary Ireland in the nineteen sixties. There are therefore inevitably some happenings in the play which seem out of place to a current viewer, such as the insouciant manner in which a pregnant girl smokes cigarettes. That said, the play holds up remarkably well in the very altered milieu of Ireland today. Not only the excellent set but also Emma Jordan’s razor sharp and challenging direction extracts from the cast first class performances which keep the audience engrossed at all times. It is worth remembering that RTE, an important engine for the ensuing social changes, was but five years old when the play saw the light of day. This revival is a rewarding and entertaining piece of theatre that transports a modern audience to another time and place.